Survivor: Africa (2001) - 6th place, 11th out - 4th juror. 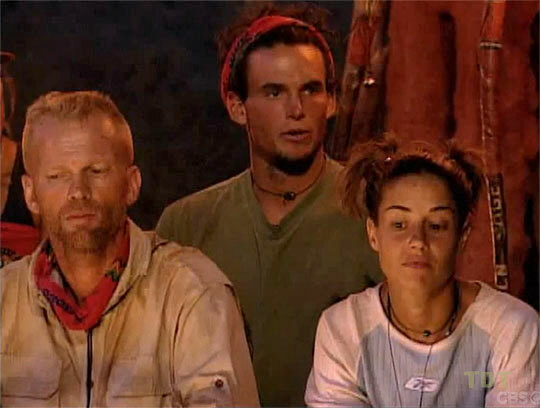 Voted out in Episode 11, "The Big Adventure" (Day 33). Africa Ep. 1 RC/IC: "Trail Blazer" - Helps push the Samburu cart. With a late surge, Samburu wins. Africa Ep. 2 RC: "Stairway to the Stars" - Climbs the final staircase, and Samburu wins again. Africa Ep. 2 IC: "Safari Supper" - Drinks her first-round shot, then Linda wins the tie-breaker. Samburu wins! Africa Ep. 3 RC: "Rock 'n Roll" - Sits out with Brandon, but Samburu rolls off course repeatedly, loses. Africa Ep. 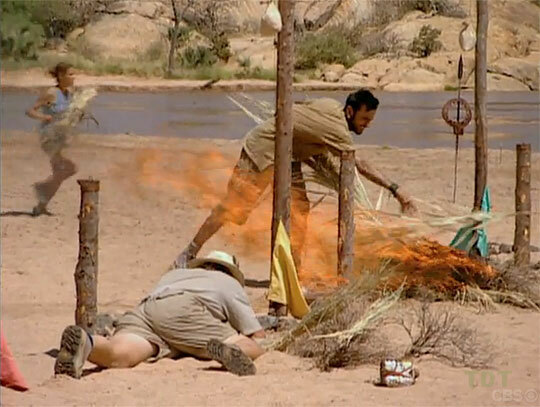 3 IC: "Distress Signal" - Helps with Silas's ill-advised plan; Samburu loses. Africa Ep. 4 RC: "Caught in the Web" - Matched up against Kim J, passes her, and Samburu wins. Africa Ep. 4 IC: "Movin' on Up" - For some reason has to help carry the giant house; Samburu loses. Africa Ep. 5 RC: "Get Your Goat" - Now with New Samburu, which loses, 20-18. Africa Ep. 5 IC: "Puzzle of Shields" - New Samburu "wins" as Kim & Ethan throw the IC to boot Silas. Africa Ep. 6 RC: "Africa 102" - New Samburu wins again, this time unintentionally. Africa Ep. 6 IC: "Spear-It Hunt" - Hits zero targets, Samburu loses at shooting flaming arrows. Africa Ep. 9 RC: "Obstacle Course" - Paired with Big Tom; loses to Frank/Brandon in the first round. Africa Ep. 7 IC: "When It Rains, It Pours" - Fourth person out, at 36 minutes (7th/10). Africa Ep. 8 RC: "Stomp-ede" - Apparently ahead of Kelly's 1, but below Frank's 5 (tie-5th/9). Africa Ep. 8 IC: "Box Your Mind" - With Kim and Frank, eliminated on the first item (tie-7th/9). Africa Ep. 9 IC: "Light It Up" - First to make fire, but does not win (2nd/8). Africa Ep. 10 IC: "African Folklore" - One of five people tied for third with four straps (tie-3rd/7). Africa Ep. 11 RC: "Know Your Loved One"- Gets one matched answer (tie-4th/6). Africa Ep. 11 IC: "Pot Shots" - Hits one pot (Teresa's), second person eliminated (5th/6). Africa, Ep. 3: Carl Bilancione (voted out, 3-3; lost trivia tiebreaker). Africa, Ep. 7: Clarence Black (voted out, 8-2). Africa, Ep. 9: Brandon Quinton (voted out, 6-2). Africa, Ep. 10: Frank Garrison (voted out, 6-1). Africa, Ep. 11: Four votes, from Ethan, Kim J, Lex, and Big Tom (voted out, 4-2). Africa, Ep. 13: Voted for Kim Johnson, who lost, 5-2. Uhh... good try, I guess? CBSNews.com (12/28/01): "Bye Bye Brat Packer"
Liane Bonin at EW.com (1/4/02): "The latest castoff explains her game plan"
"Kim Powers was born and raised in Bridgewater, New Jersey, where she lived with her family prior to attending college. She graduated from Elizabethtown College in Elizabethtown, Pennsylvania with a Bachelor of Arts degree in Mass Communications. Currently, she is a freelance marketing executive for an athletic wear company and is living in Conshohocken, Pennsylvania, a suburb of Philadelphia. Powers's favorite hobbies include running, biking, boxing, growing herbs and vegetables, cooking and entertaining. She describes herself as extraverted, tenacious and competitive. Kim Powers was engaged to be married for over a year, but less than three weeks before the big day, she called it off. Still single, she currently lives in a very socially complicated "tribe" with three other female roommates and her cat, Squirt. Her birth date is December 3."